You know how I love figures of speech, alliteration one of my favourites, well to add to the B's we are going out on the boat today, but I am getting a quick post up beforehand! I mentioned that I will be doing a celebration to mark blowing by 250 followers on Bloglovin'... As well as that milestone, I've been asked to be part of a bloghop this Fall sponsored by Paintbrush Studio, and I plan to have a giveaway or two during that! Do you spy the rich red fabric box in the middle? That red is from Windfall, the collection I'll be working with, and it is BEE-you-tee-fullll. Want a closer look? as you see! 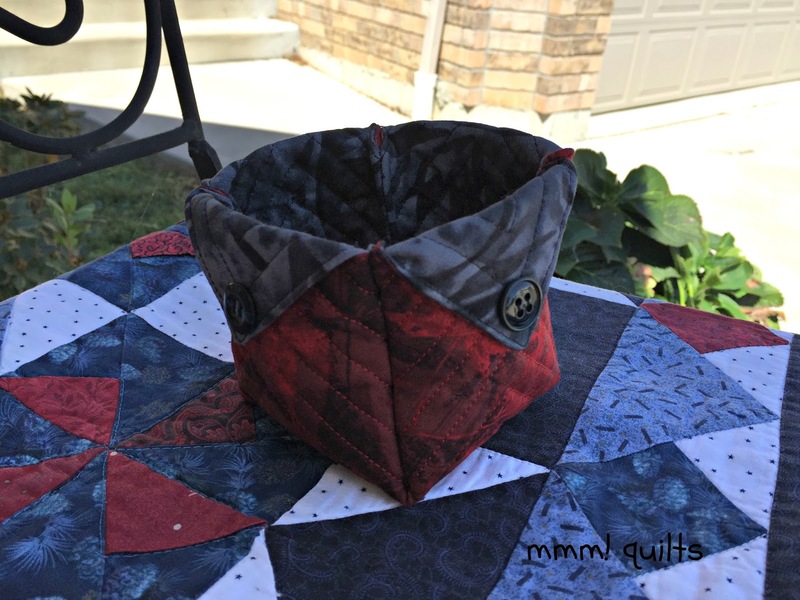 I did my corners with French seams, trying them with seams in and seams out. I think I prefer the seams out look. These were fun and quick to make. Stay tuned for when they are being given away. This is written in play format as it is the script for the play that was presented on stage in London's Palace Theatre earlier this summer. It was really good, not quite as good as the original seven books, but still, what amazes me about J. K. Rowling is her genius. Without giving anything away, she sets things up early in the book, or in this case, play, that you don't see until much later, providing a means out of a sticky situation. I got this on Amazon, but it ships from the UK. I believe it has only been released in the UK at this point. It has four novellas that fill in blanks in "the Big Enormous Books (BEBs)," Diana's term for her Outlander novels. Worth a read as you find out what really happened to Roger's parents, a little more about Lord John, (fascinating true stuff about electric eel parties of that time period, as well as his part in the Battle of the Plains of Abraham--yep, you read that right, and I knew how crazy cool it is/was what the British army did, but to read it 'firsthand', with a feeling that the author had actually been there, a style at which she is so adept), and a little more about another Murray, as well as the Comte St. Germain. Diana amazes me with her intelligence, her vast knowledge of history and science, plants and social niceties (and some not so niceties lol), and on and on. More very intelligent fiction. This series features Flavia de Luce (isn't that a terrific name? ), precocious 11-year-old obsessed with all things chemical and poison, who often finds herself having to solve crimes of the murderous nature. Set in 1950 in southern England, they are excellent mysteries, with humour and that unique way Bradley has of not taking away from Flavia's youth, yet you, as the adult reader sometimes see things that go over her head. However, having said that, a LOT of what Flavia talks about wrt chemistry, and a lot of what she observes go right over our heads! Well mine for sure. I read the third one out of order so I'm back reading this second book. The Sweetness at the Bottom of the Pie is the first. 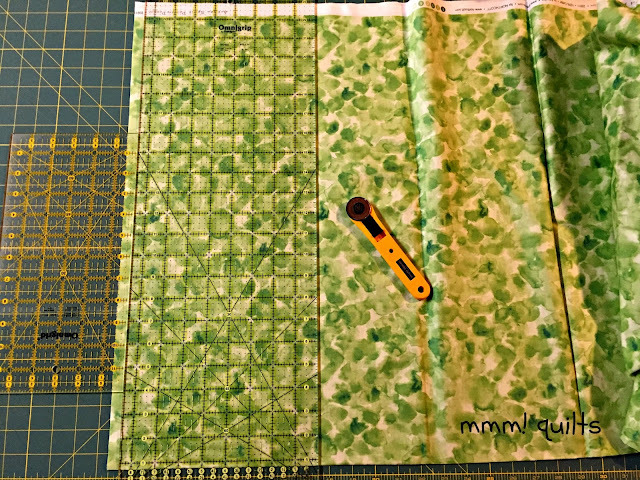 I caught up on the August cutting instructions, and plan to start the September sewing later today for Cheryl's Meadow Mystery. 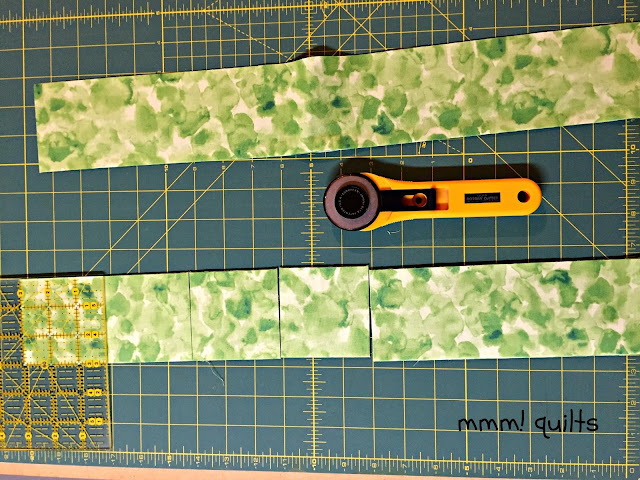 I thought I'd share a tip, which I've mentioned before, as to how I cut when I have several strips the same width, as this does, for example, four 3" wide ones and multiples of other widths. Below you see me cutting these 3" ones. 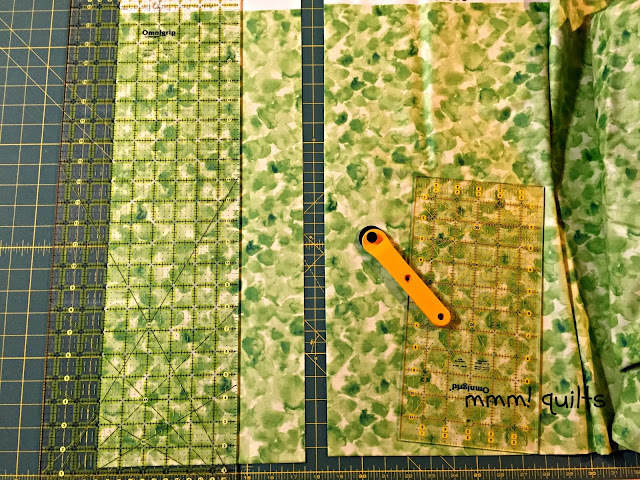 I've already squared off the left side of the fabric. 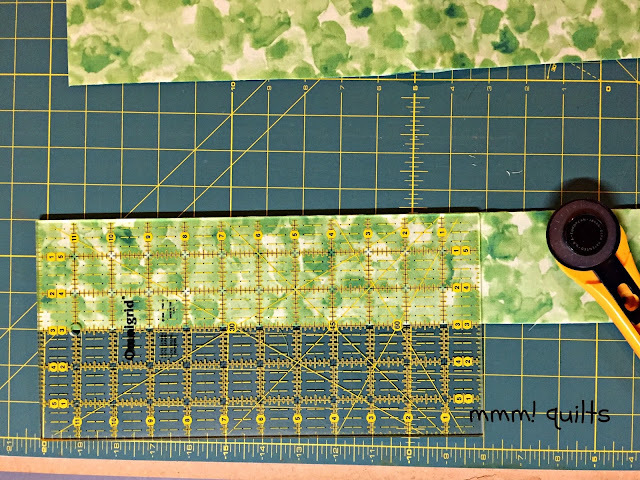 Then, using my 8 1/2" X 24" ruler, along with my 6X12" one, I line the 1/2" mark of the 12" on the cut edge, butting up the 8 1/2" one against it. This gives me 9", so will give me 3 strips. I also align the markings along the fold to ensure straight strips. Why not just cut 4 strips separately? Well, the longer you have of a 90-degree angle with two straight sides, the cut edge and the fold being the two straight sides, the more accurate you will be, and the less often you have to keep truing up the cut edge to avoid the 'V' shape that occurs at the fold if you don't keep checking that squared-off edge. Cut. Then move your ruler backwards, or to the left, to the 6" line. Cut again. Repeat at the 3" line. You can cut the 3" blocks in this same manner. Below I've used my 12" ruler at the 12" mark, so I'll get 4 squares. The longer you can get a line along the bottom edge, the truer your cuts will be! Now I'm off to buzz around on Lake Erie for a bit. While I'm out there, remember you've still got a few hours left to pick up a class at Craftsy for $19.99! Here is my review of some from my all-time favourite quilt teacher, Angela Walters. A beautiful day to be out and about on the lake. Love the baskets I may just have to make one or two for myself. I confess that I enjoyed Harry Potter but tired of him after a couple of books but I totally love Diana Gabaldon. Thrilled to hear of anything new of hers. Haven't been reading much lately but am always on the hunt for new material. 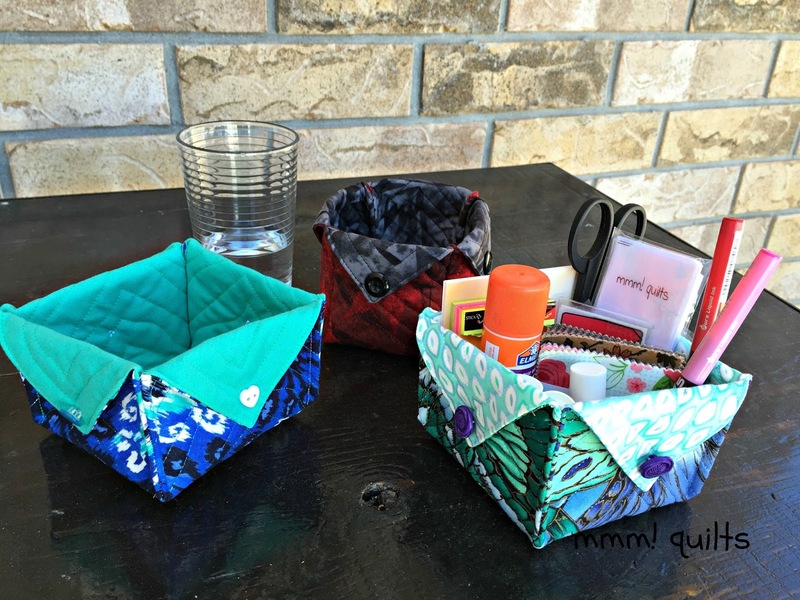 Thank you for the link to the baskets tutorial; this one looks so easy. Thank you too for the cutting tip; it's brilliant. This should lead to accurate and faster cutting. Thanks for the cutting tip and your fabric is beautiful for the mystery! Congratulations are in order for surpassing 250 followers! I'm not surprised as I'm aware of your great talents! 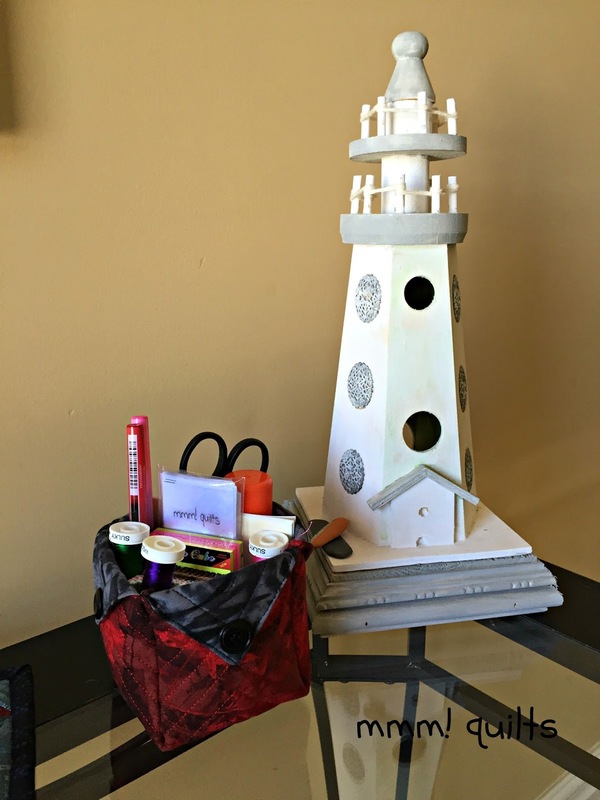 I'm looking forward to your projects in the Paintbrush blog hop...I know it'll be fabulous! Those colours of the strips are beautiful! Allowing alliteration in additional appendages lets me say these are blooming beautiful baskets for bits and bats or bits and bobs . I love alliteration, also French seams. I bet those seams were pretty thick. Hope you had a great time at the lake. 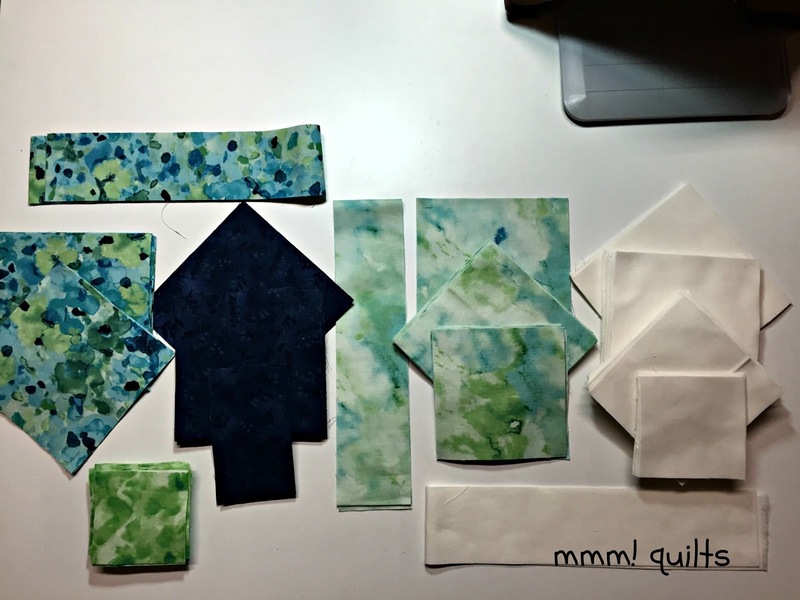 Your mystery quilt fabric is beautiful and your tip is very handy. Congratulations on 250+ followers!!! Friends, followers and fans feverishly fawning over fabric!! !